71st Independence Day Celebrations Live: India is all set to celebrate its 71st Independence Day on 15 August 2017. 70 years ago on August 15, 1947, India got freedom from British rule. This day is deemed as a national holiday in India, grand festivities and processions are organized in the capital city Delhi and all over the country to celebrate the occasion.The Independence Day celebration will begin at the historic Red Fort in Delhi. Every year, One of the significant traditions that have been observed on 15th August is the flag hoisting ceremony at Red Fort, Delhi by the Prime Minister of India. 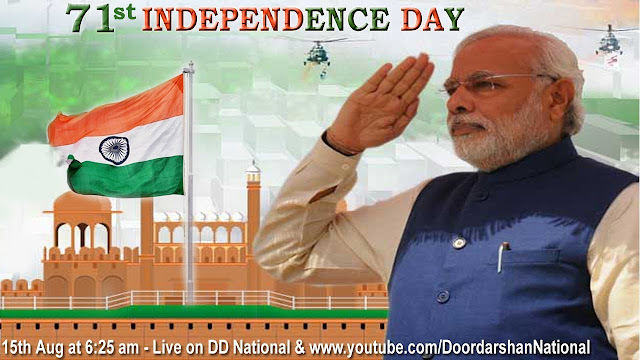 Now, The 71st Independence Day celebration will be also live telecast on DD News. Prime Minister Narendra Modi will hoist the national flag and address the nation commencing the Independence Day celebration. The Independence Day celebration 2017 will begin from 6.30 AM onwards. You can just click here to watch the Independence Day 2017 celebration from the ramparts of the Red Fort in the national capital. You can also see the 71st Independence Day Celebrations event LIVE on all major News Channels in India. The translated version of Narendra Modi’s Independence Day 2017 Speech in different regional languages like Urdu, Marathi, Gujarati, Tamil, Telugu, Malayalam, Kannada, Bengali, Punjabi, Kashmiri, Oriya, etc will be available on regional channels of c.